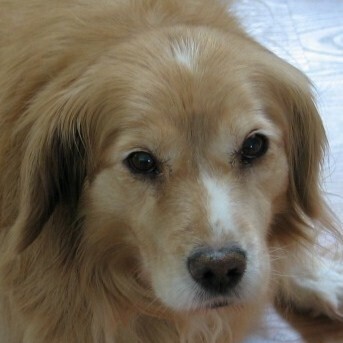 In 2006, our friend Vicki decided the timing was perfect to open her heart and her home to a 4-legged senior citizen. A savvy dog-lover involved in rescue, she knew that when elderly dogs are surrendered to shelters, they’re often the least likely to be adopted, even tho they have a wealth to offer. So, she sought a vintage pooch. “You rock, girlfriend!” Cooper exclaims. Scooty’s fitness routine included long walks and weekly swims at a local dog-friendly spa. Nice dog-paddle! And even tho her blond coat shed golden tumbleweeds all over the house, Vicki didn’t mind. Her Scooty was a treasure–an Angel in Fur! Amiable and affectionate but never clingy (hear that Swirl? ), she’d spend lazy days watching the world go by from the porch—that is, when she wasn’t digging a comfy, cool pothole in the garden, to nest in on toasty-warm days. She even liked Rico the cat. In 2 years, Scooty went from 68 pounds to a svelte 43, and regained lost stamina. Vicki also adopted another senior pooch, Ernie, a jaunty little Beagle mix. On Halloween, Scooty dressed as an angel (of course!) and that scallawag Ernie swaggered in a pirate costume, for trick-or-treating at a local nursing home. Senior-2-senior outreach: Oh, the fun they had! It was grand. Very Special photos courtesy Vicki Holt. Thanks!